1 of 3 Heat grill to medium-high. Cook bacon in a large saute pan over medium heat for 8 to 10 minutes or until crisp. Remove with a slotted spoon; set aside. 2 of 3 In the same pan, remove all but 2 tablespoons of the bacon fat (compensate with olive oil to reach 2 tablespoons, if necessary). Add corn and onion. Cook over medium heat for 8 to 10 minutes, until softened. Add flour and cook 1 minute, stirring constantly. Stir in milk. Bring to a simmer; cook 1 minute. Turn off heat. Stir in honey, 2 tablespoons of the chives, 1/4 teaspoon of the salt and 1/8 teaspoon of the pepper. 3 of 3 Meanwhile, skewer shrimp. Coat with nonstick cooking spray and season with remaining 1/4 teaspoon salt and remaining 1/8 teaspoon pepper. Grill 2 minutes per side or until cooked through. 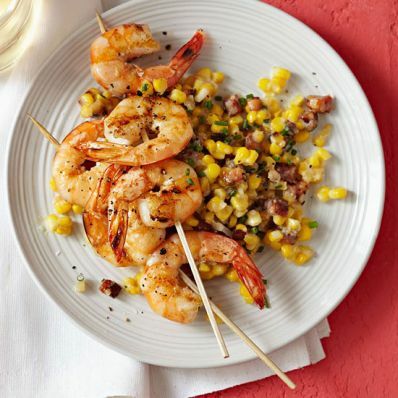 Serve shrimp skewers over corn. Distribute remaining 1 tablespoon chives over each serving.